My Ballard Designs catalog is consistently one of my go-to “decorating bibles”. I look forward to receiving the catalog in my mailbox just as much as my shelter mag subscriptions. So when I received an email inviting me to tour the Ballard headquarters in Atlanta, I may have squealed like a preteen about to meet Justin Bieber! Yes, Ballard is my Bieber. What a fantastic opportunity! I was thinking about you during the experience and snapping (sub-par) pictures on my iPhone in order to share all of the luscious details with you. Propped up against the window near the cubicles were these gorgeous color boards. All of us were impressed with the inspiration gathered on those boards and they received quite a bit paparazzi from our crew ;). The peacock board was my favorite. I know Emerald is the color of the year, but blues still have my heart. The Ballard Team said there will be a lot of fun pops of color coming up in 2013. 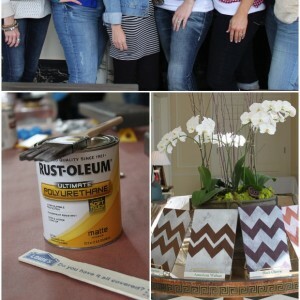 I will show you a sneak peek of some of that color in the next photo collage! Pictured below are two beautiful BFF’s that I thoroughly enjoyed meeting. Mollie is one of the Marketing Mangers for Ballard and just so happens to be besties with Britany Simon from Design Star. Birds of a feather I tell ya…*wink*. Below you can also see some sneak peeks for the upcoming J/F (that’s top-secret Ballard speak for January/Febuary catalog). Notice the colorful velvet headboard? I got to pet one in real life and it was scrumptious. Truly fascinating to see the entire catalog with all of its design concepts and numerous page edits up on the wall. Do you see all of those Ballard editors working under an umbrella on their Mac Desktops above? What a fun office environment! Although admittedly if some of my fellow bloggers were working that close to me I would be tempted to gab the day away. They were all as quiet as the mice they were using to click, click, so it must indeed work for them :). Directly above you can also catch a glimpse of the J/F catalog cover. Notice the fun pops of color on the wall, on the flowers, and on the chair and ottoman. 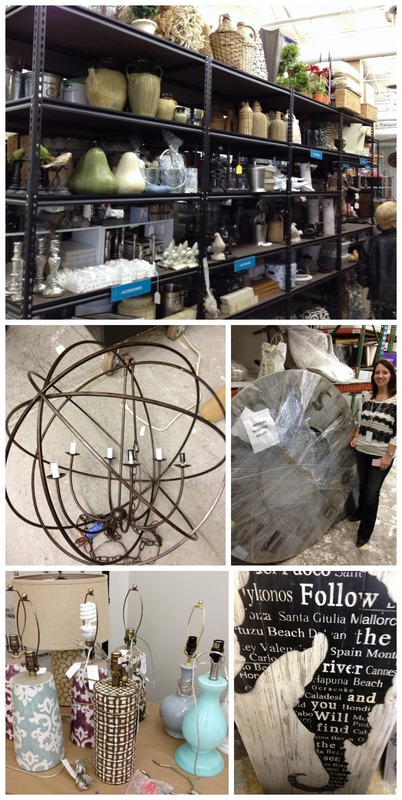 Our tour continued with a perusal of the merchandise, props, and Paris antiques used to inspire new merchandise. Do you see 5’9″ Sarah standing next to the antique clock? It was HUGE and glorious. The lamps and seahorse subway art pictured at the bottom are products slated for the spring catalog. My favorite part of our experience was getting to go on-site for a Ballard photo shoot at a gorgeous estate home in the Atlanta suburbs! Jill Sharp, Creative Director for Ballard, explained the process of shooting the catalog and showed us some of the tricks of the trade. A home’s living room may also be repainted and shot from a different angle to act as a bedroom or dining room. 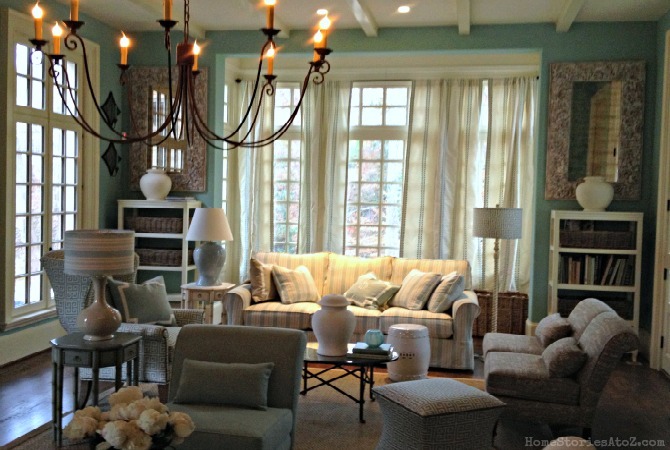 Too short curtains are hidden behind a sofa, end table, and basket. 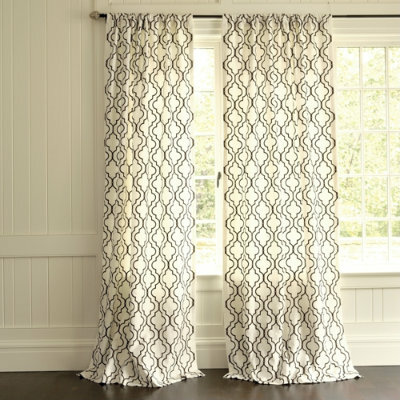 (Funny, I am actually using this trick with my dining room drapes right now. 🙂 ) Tall ferns are placed directly outside room windows to cover up an incomplete landscape. I wish I had my “real” camera for this room because it was breathtaking. I think we literally gasped when we walked into it. 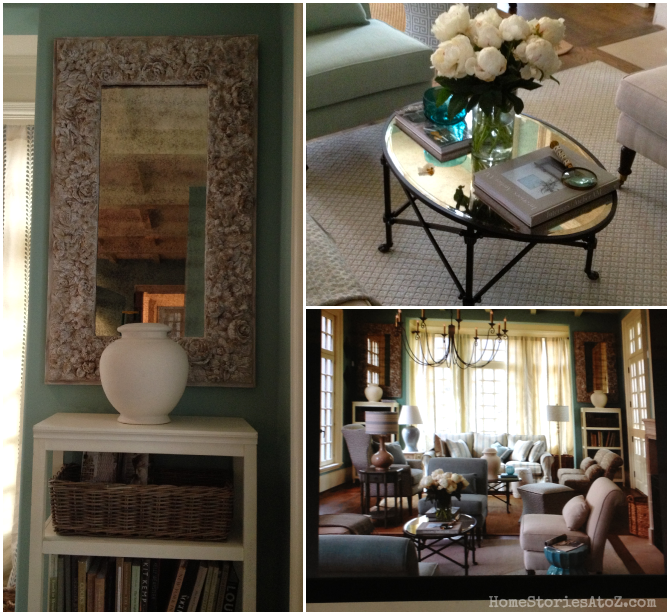 The mirror is a replica of an antique and the mirrored coffee table is brand new and fantastic. I really, really want the coffee table! In the bottom corner below, I snapped a picture of the photographer’s computer screen. This is his shot of the room for the catalog. Below is Jill’s sweet pug Ricky Bobby who shows up from time to time in the catalog. He actually has his own blog and was such a little sweetheart. 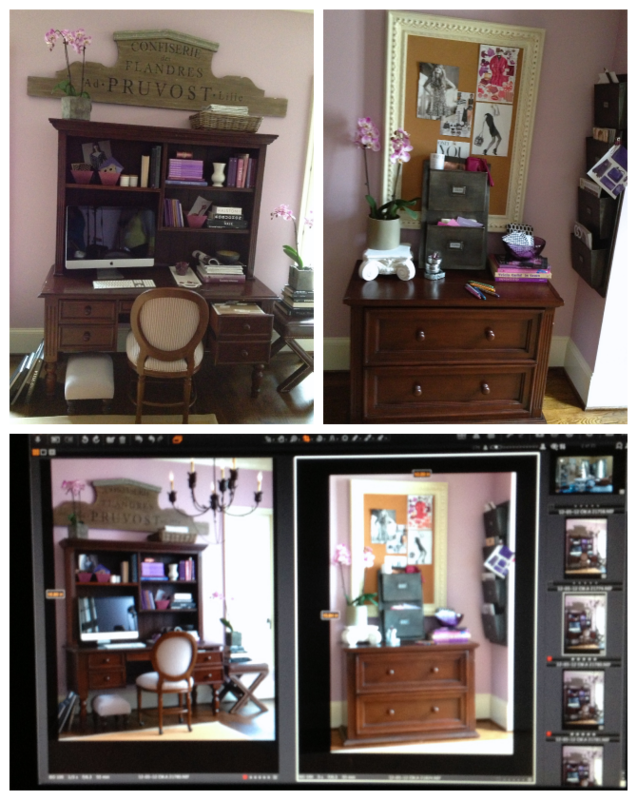 In the second picture, you can see the computer screen and marked up page layouts for the shoot. And lastly, the prop closet! Jill’s assistant gets to shop for a ton of fun props to fill in the rooms. I think I need my own “prop closet”! After our full day with Team Ballard we shopped a bit at the Ballard retail store. I bought two pillow covers because I just couldn’t resist them. I so do not need another toss pillow in this house, but then again when can you really have too many toss pillows? I’m definitely testing the limits. LOL! I’m loving this neutral leopard print paired with the floral lamp shades. And a few more coveted in-store photos. We were actually told that in-store photos aren’t typically allowed so enjoy them! I came away from my trip having a newfound respect for Ballard Designs and the work, dedication, and true artistry that goes into the making of the products. From design conception, to production, to product placement—a gazillion ideas, hands, statistics, and love have gone into each piece of Ballard merchandise. It was an honor to spend “a day in the life of Ballard” and I am thrilled that the company took the time to educate bloggers on all they do. Cheers Ballard! Bloggers indeed love you, so thanks again for the educational and inspirational tour! *Disclosure: I was provided a trip to Atlanta to tour Ballard headquarters. I was not asked to write a post about my time at Ballard Designs and am not compensated to do so. I am happy to tell you about any home decor company that inspires and takes an interest in bloggers. All opinions are always 100% my own. I love the catalog and loved this behind the scenes peek. Thanks for sharing it with us, Beth! Wow. Some serious eye candy. I’m certain I would have been salivating the entire time!! What a wonderful experience. So much inspiration!! Every bit of that looks like a dream… so.beautiful. Wow! I would have been completely overwhelmed and probably would have been squealing with every new turn of a corner. Thanks so much for sharing. I’ve always wondered what it must be like to work for a company like Ballard Designs (I was just browsing their catalog yesterday). It’s completely changed how I look at the catalog! Now that I know all of the work that goes into each and every product it’s an entirely new experience. How fun is that?! I love that room with the mirror coffee table! Wow!What an awesome experience. That would be my Beiber too!! Lucky girl! How fun! 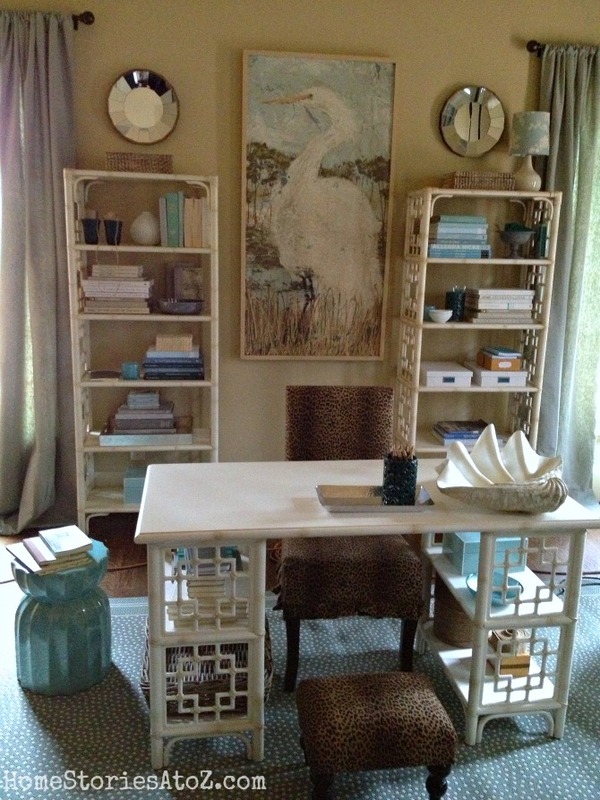 Those pieces are gorgeous and I am always drawn to the blue boards too! Congrats on such an awesome opportunity! Oh my! How fun 🙂 I am ordering one of their media centers tonight online and it can’t be delivered until April! Everyone loves Ballard Designs!! How fabulous! I envy you!! Ballard’s is my favorite catalog company too! Yes, I had to keep from drooling on the merchandise and gawking too much at everything and everyone. I was really surprised with how down-to-earth and friendly the staff all were. Perhaps it’s the Atlanta charm, but it felt like the Ballard Team truly enjoyed each other and their jobs. It was refreshing to witness. This looks like so much fun! What an amazing experience…I just love Ballards. Thanks for sharing with us! It was truly an amazing experience and one of my “blogging highlights” for sure!